Did I make this myself? Nope…but it sure looks like one after a really disappointing cake fail story! 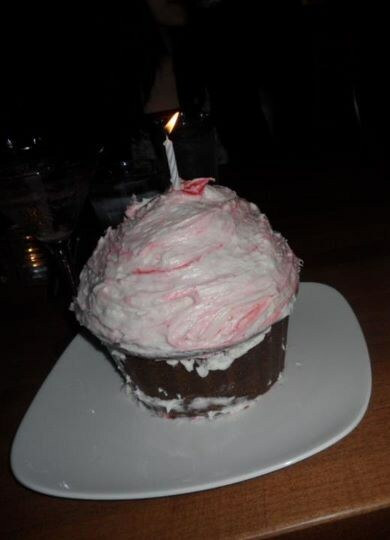 I got my friend a giant cupcake for her birthday at Bell’s Bake Shop in Steveston Village, and by giant, I mean it’s supposed to be equivalent to around 20 cupcakes, so it feeds around 10 people. This one was red velvet with buttercream frosting. So I picked it up at the store, and they showed me how it looked inside the box, and I went back into the car carrying it on my lap while I was driven to the restaurant for dinner. I was told to just put it at room temperature so I handed it over to my waitress. Around 15 minutes into dinner, my waitress comes over and tells me that I should take a look at my cake. The manager was also there and said that he had opened it and the cake had fell. Basically the whole top half had toppled to one side. I was extremely disappointed and asked if they could do anything to fix it up. And this is what they came up with. Pretty good compared to what a mess it had looked like…The red colouring is from the birthday message I had paid to get written, and I told the chef to just smother it around since the message was ruined anyways. I had paid $35 for the cake with $2 extra for the birthday message. I don’t know if it was my own fault from the way I carried it, or the cake shop themselves, but I am definitely not going back there again – at least not for a giant cupcake. Yes, the giant cupcake looks really cool and presentable at the table, but if it is so unstable and just topples over, I really don’t think it’s worth it. I might as well just buy 20 different cupcakes.